We are finally on our way. It took a lot of last minute stress and commotion but we finally got our stuff packed and mostly operational and left home just before lunch. After a lot of upgrades to the mechanics of the Oka over the past 3 months, to meet the challenges of a desert crossing, we left with some trepidation. Had I done it right? Were there bolts left loose waiting for their moment to cause maximum trouble? Removed the rear axle (which took a lot longer to do than to say) to replace the rear differential with a Limited Slip Diff. We’d got bogged last year partly though not having any locking differentials and we weren’t going to allow that to happen again, were we? Replaced the transfer case rear oil seal which was also leaking. Had a replacement windscreen fitted (under warranty) after last year’s version cracked massively though no fault of ours and ended up looking like crazy paving. The reason I did all this upgrade work is that we are meeting up with some friends in Halls Creek in WA to attempt a crossing of the Great Sandy Desert from Fitzroy Crossing to 80 Mile Beach via old mining tracks, where they exit, or making or own way over the intervening sections where they don’t, not something you’d want to attempt alone. 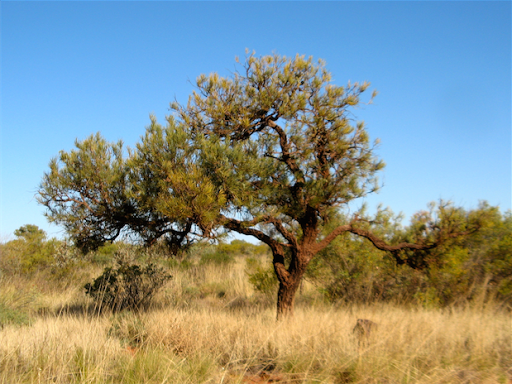 Our prime objective is to reach Dragon Tree Soak in the centre of the desert (and return safely to earth of course). We did a lot of pre-planning and have track info and map plots of people who had done this before but that won’t make the challenges any less, well, challenging. So yesterday we reached Port Wakefield before our late lunch, all of 80km up the track. 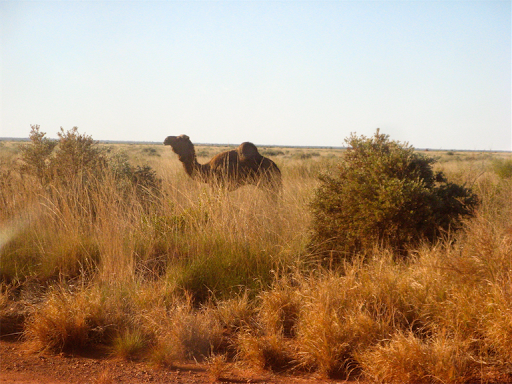 By late afternoon we’d reached Mambray Creek, 40km south of Port Augusta, a “No Camping” rest area we have camped in several times before. 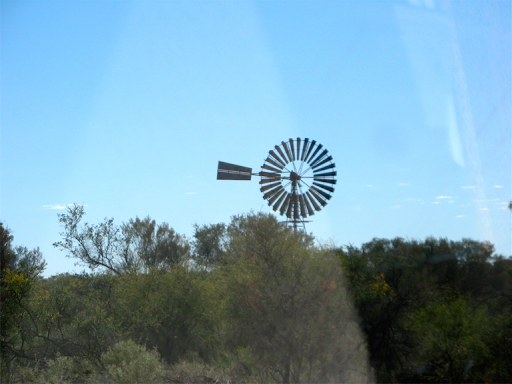 Not surprisingly, we slept for about 10 hours, but a hot breakfast and even hotter shower rejuvenated us for the next leg of our journey, a shopping trip into Port Augusta. 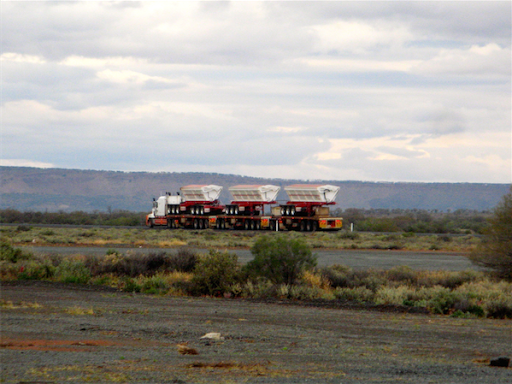 After buying up 190 L of Woolies best diesel, we carried on up the track towards Alice Springs without realising that the rear gate with the spare wheel on it wasn’t properly closed and locked. 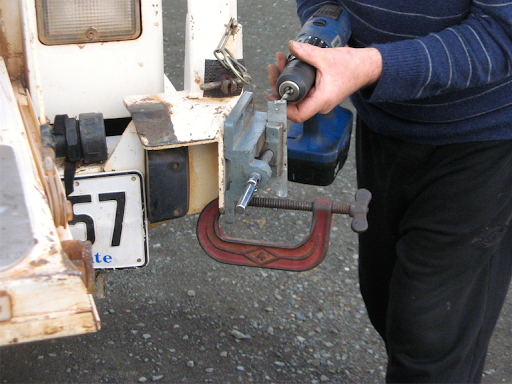 My fault for not checking adequately and a few km up the track, flashing lights from a following vehicle alerted me to the problem, the rear gate had opened and was swinging wildly about with 100kg of wheel and other items attached to it. We stopped ASAP as you would, and fortunately nothing was damaged except my pride and the safety strap I’d put on to prevent the gate from opening too far. That had snapped but presumably absorbed some of the kinetic energy of the swinging gate. Relieved and mollified, we were soon on our way again. 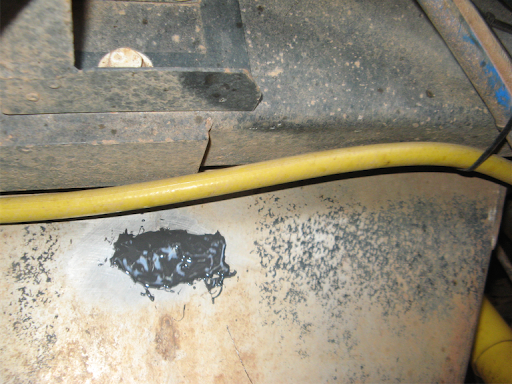 We also discovered minor leaks from the rear fuel tank and the main water tank, both of which will have to be fixed once their contents have dropped. Not serious, just annoying. After the freezing last few days in Adelaide, the warm sun which appeared in a clear blue sky this afternoon was positively burning hot and we had to use the sun visors and opened the vents. Not quite A/C weather yet but a welcome change. We stopped at Glendambo Roadhouse to post a birthday card to Diane for her forthcoming birthday which is promised to arrive by the one after. We should have posted it in Port Augusta. After a long 450km drive today we are camped in the centre of the Woomera Restricted Area, just south of the 30º 30’ parallel. 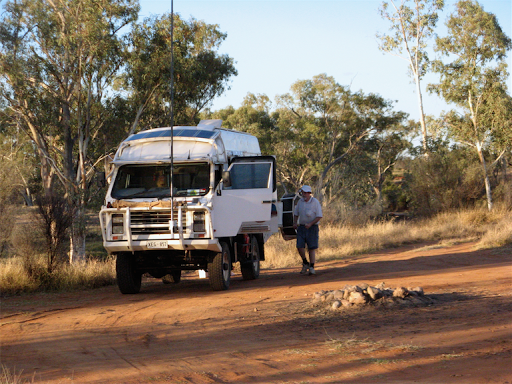 We made contact with Dave and Pauline on the radio, who are at Cape Keraudren on the mid coast of WA, heading up to Broome. 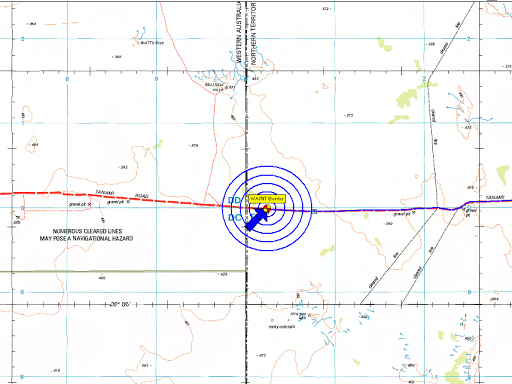 We haven’t made contact with Deano and Kaye yet who were in the Katherine area when last we heard from them. Very clear still night with full on starscapes, I wish I had set up my camera on its tripod, and learned where the manual exposure controls were, other than the “Auto” mode. Added items to our TWSF (Things We Still Forgot) list: my soldering iron, without which I can’t fix the LED lights which are continuing to fail on a regular basis, and a small frying pan for fried eggs. 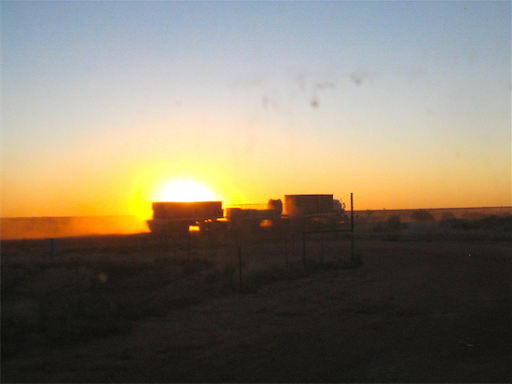 Ah well, the bright lights of Coober Pedy or Alice are still ahead. However I did buy a replacement for my iPad charger cable (which is also at home) in PA. It’s a nice dark pink Belkin one which nicely matches the gaudy pink protective iPad cover that someone other than me chose. Today on our 480km travels we bypassed Coober Pedy except for a comfort stop, bypassed Cadney Park except to check the fan due to the engine overheating and then bypassed Marla completely without stopping (which is presumably what bypassing actually means). We also came across another overturned 4WD with the roof crushed in. It had recently happened but emergency services were present and a tow truck came roaring down the road towards the site. Not for the first time have we seen 4WD’s overturned on this road, and sadly it’s the most common form of accident on outback roads and tracks, with speed and inattention being the main cause. A sad end to someone’s holiday with their belongings scattered over the roadside. We are camped tonight at what I thought was the Chandler Rest Area but it’s not signed thus, so presumably that’s still before us. No matter, this is perfectly adequate for an overnight stop. I am manfully attempting to lighten the vehicle load for the forthcoming desert crossing by reducing our wine stocks as quickly as possible. 1) Overheating of the engine, not a serious problem right now but it will be when the temperatures rise and we have the A/C on. 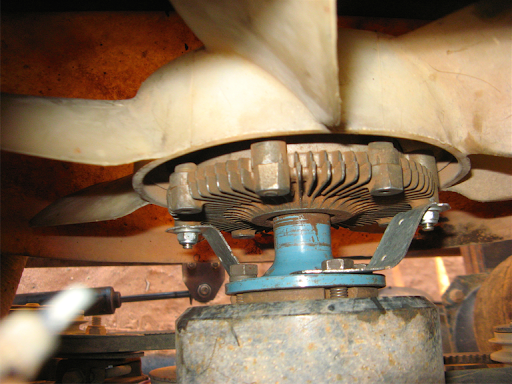 The problem is that the viscous hub in the fan unit is not “viscousing” anymore and doesn’t lock the fan to its pulley when the engine gets hot. So I’m investigating ways of coupling the fan pulley to the viscous hub so they are permanently locked together. 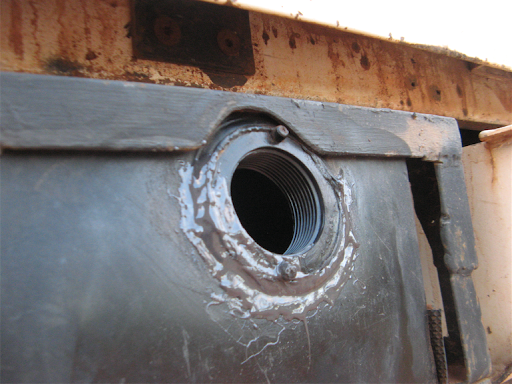 Ideas vary from brackets to tie the fixing their bolts together, wiring or roping the fan blades to the pulley or welding the whole bloody lot together. Idea #1 is probably the best one, but in a 3 way radio hook up with Dave and Deano, Deano suggested looking at the spiral spring on the front (if it’s the original Oka type) and tightening it half a turn. A task for tomorrow when it’s light again and the fan is cool enough to actually touch. 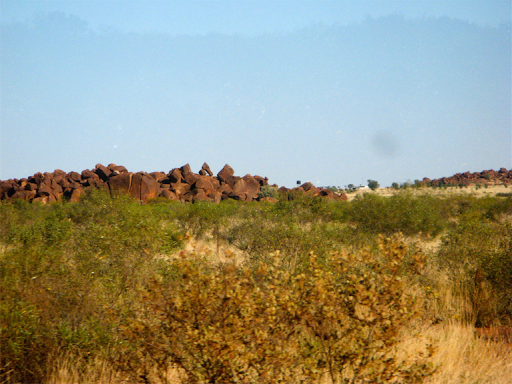 (Dave and Pauline were at Shelamar Station south of Broome and Deano and Kaye were in Kununurra). 2) The 9m whip antenna refused to function. But how can a piece of straight wire refuse to function? It was due to corrosion inside the connector on the end of the coax cable so I replaced both ends with new connectors (after a frustrating half hour searching for where I stored the crimping tool) and we are back on the air. Rained gently on and off most of the night but quite warm, although no aardvarks were seen (just testing my spell checker). Up early, bacon and eggs for breakfast, but without the bacon, and all before 7am. That’s what happens when you have no TV to watch and retire at 9pm. 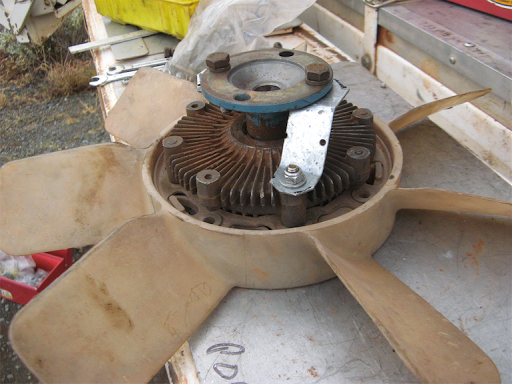 The next 3 hours were taken up fitting straps to the viscous fan to lock the fan pulley to the fan hub. 20 minutes was used constructing the straps from some steel strips found on a discarded Westinghouse oven, and the remainder of the 3 hours was taken up reinstalling the fan and getting the 4 sodding fixing bolts to line up. Par for the course I think. These were then attached between the fan pulley and the fan unit, locking them together, one on either side to maintain the balance. The straps are angled so the pulley “pulls” the fan around without any twisting, which, after all, isn’t that what a pull-ey is supposed to do? It works fairly well and drops the maximum temperature by 5º, but it can still be improved further with longer fan blades which actually fit the cowling properly and a fully working viscous fan hub to save power. It got quite hot this afternoon (27º) with a near cloudless sky, so we had the A/C on most of the day and the temperature remained within an acceptable range (ie, not boiling). 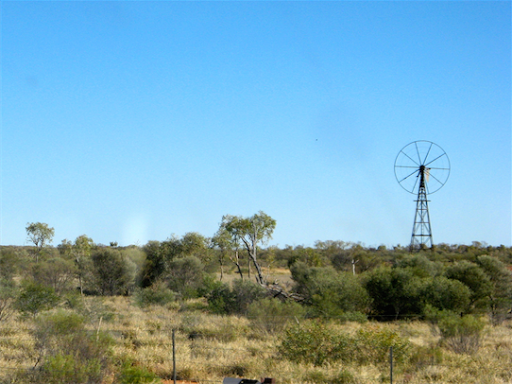 Had lunch at the SA/NT border and cruised through very scenic countryside to our campsite in the Owen Springs Reserve abut 60km south of Alice Springs where I had a couple of leaks to fix. 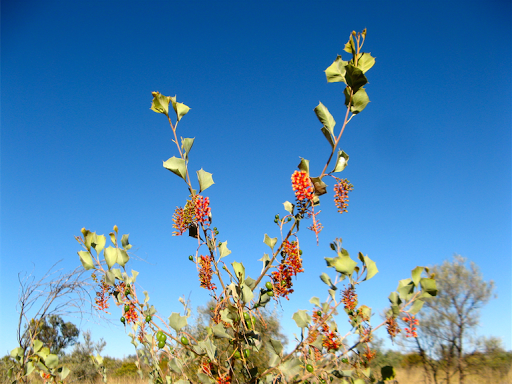 The Owen Springs Reserve was a former cattle station bought by the NT government in 2002 and opened as a free bush camping and 4WD tour destination close to the Alice. 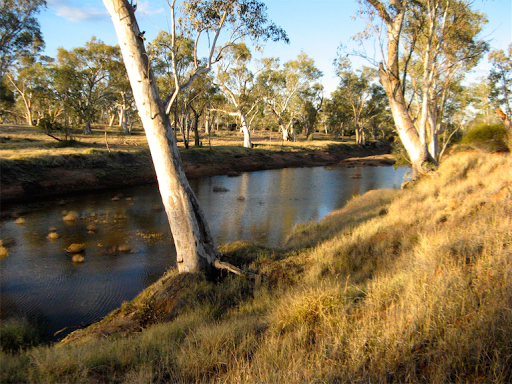 We are camped near the Redbank Waterhole which looks very pretty with ducks and mozzies and small flying creatures in abundance. And it is getting warmer. 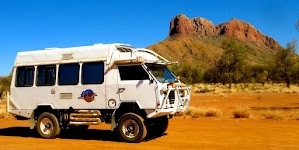 Shopping, “laundry-ing” and resupplying in the Alice tomorrow and then we set off NW up the 1100km Tanami Track to Halls Creek, a route we haven’t traversed since blowing out a tyre up there on our Disco in 2002. More epoxy liquid steel to be added tomorrow morning and we can try a test fill of both tanks (we do have several other tanks so all our œufs are never all in one panier). 1469km done since leaving home (without refuelling) with 65km to go to Alice and then 1100km to Halls Creek, a total of 2634km to get to the start of our desert crossing. Happy Birthday Diane, hope you enjoy your day and any events planned to commemorate your milestone. Owen Springs where we camped last night is quite a picturesque location and well worthy of further exploration when next we past this way. 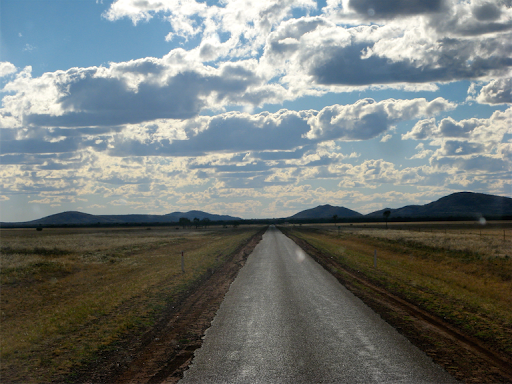 The 65km into Alice Springs seemed a lot longer than it actually was but everything was very familiar to us when we got there since we’ve been there many times before (about 9). We quickly located the Woolies supermarket which satisfied most of our culinary needs. The Home Hardware and K-Mart stores met all the others, except for the Town Library which met the comfort stop requirements since there are very few public loos in the Alice due to certain groups of people who appear unable to treat them well. 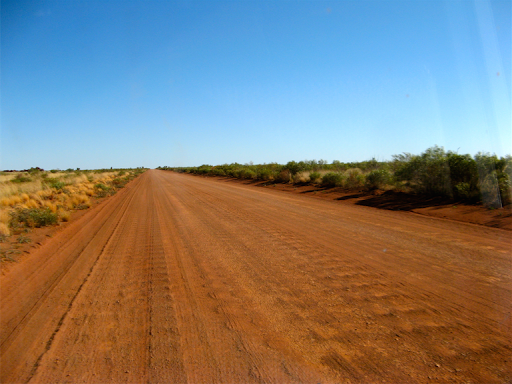 By mid afternoon, fuelled and watered up with 220l of diesel and 150l of water (both tanks fixings seem to holding), we headed north for the Tanami Track. 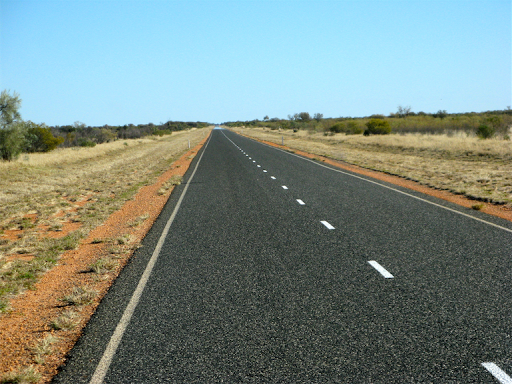 This road north first takes us to the highest point on the Stuart Highway, around 732m. There is a plaque and monument to this point which tells you everything you need to know about the Stuart Highway except, that is, exactly how high the highest point actually is, we have to use our GPS to estimate it. 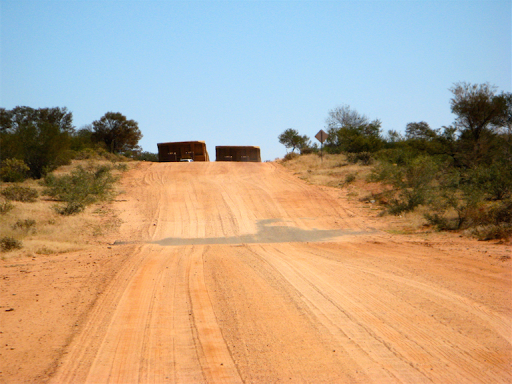 The first 100km or so of the Tanami Track are very scenic but particularly annoying since it has only a single strip of bitumen down the centre, and to pass another vehicle, both have to put 2 wheels on the gravel, showering each other with small rocks unless you both slow down. When one doesn’t, a chipped windscreen is the result and I hope we won’t have yet another cracked windscreen as a result. I guess we should be grateful because even this thin strip of bitumen will end soon and then we’ll be on to a gravel /sandy track for the remaining 1000km. Somewhere along the track today, about 39km ago, we crossed the Tropic of Capricorn with no fanfare or signs and we are now camped at the Mt Chappie Rest Area about 120km NW of the Alice. Only done 220km today but we did spend 3 or 4 hours doing our “laundry-ing” and resupplying, one of the rare occasions when we actually achieved everything on our shopping list. I was awoken very early when J went outside for a comfort stop and I thought I heard her softly calling me from the darkness, as if she was being attacked and abducted by some nefarious persons and somehow wanted my involvement in the process. 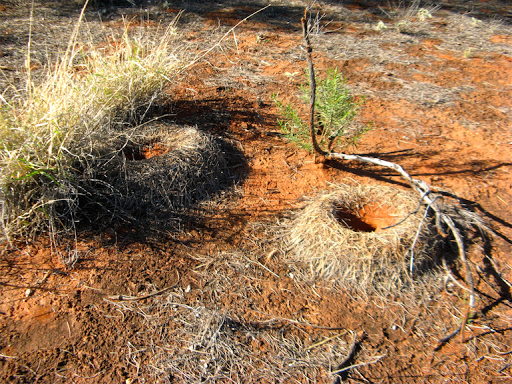 I rushed out of bed but fortunately it must have been the breeze in the spinifex and the last thing she actually wanted was me assisting in her endeavours. You’d think she’d show a little gratitude? Later when making breakfast this morning, I first got the all stuff out that I needed, but then I thought “is there a word for things you have to do before the first thing you do?” There ought to be, but this line of thinking could take some time. 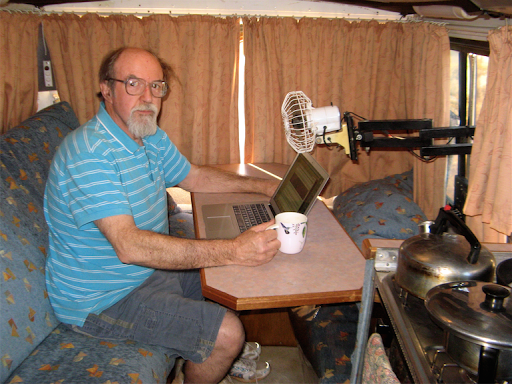 It was and still is a hot blue sky day and I’m sitting at the table in the back of an Oka with a nice cup of tea (wine will follow) and the cooling fan blowing straight in my face. The track however wasn’t quite up to the same standard. 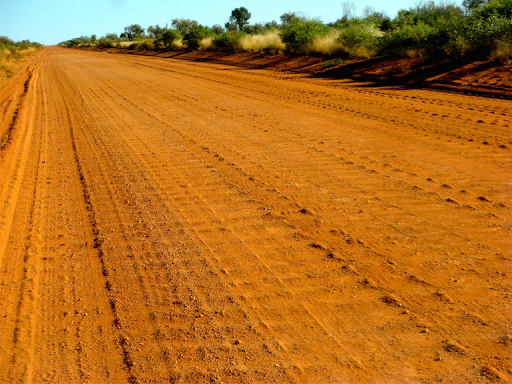 It started well enough with the single strip of bitumen, which became variously sandy corrugations or a full on 2 lane highway. We did come across one strange sight blocking the track, what could it be? 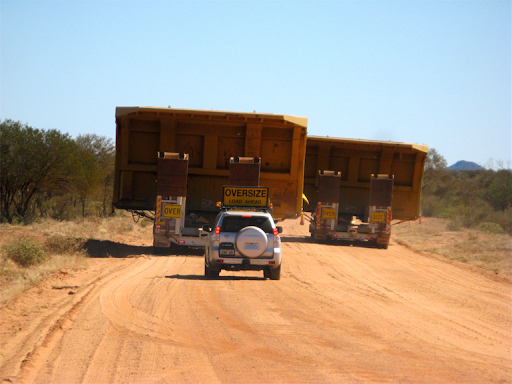 The answer was a couple of huge mining truck trays being transported to the Granite Goldmine. Why they were blocking the whole track is a mystery, they were moving at about 0.2 kph, and yet one was overtaking the other. Eventually all of the above morphed into a very corrugated gravel track which made going very difficult, slow and/or noisy. Various nuts and bolts came loose but fortunately nothing serious. 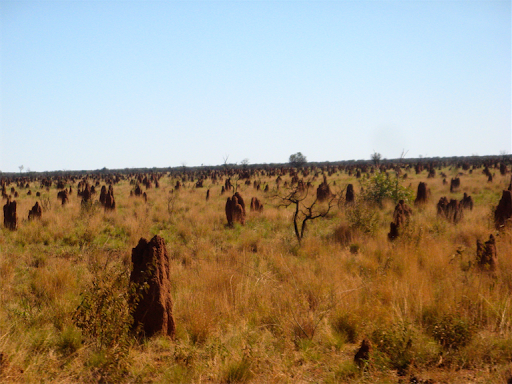 Despite the corrugated conditions we did manage 390 interesting km today with the A/C on, and we’re currently in almost the middle of the Tanami Track, 550 km to Halls Creek or 550km back to Alice Springs. 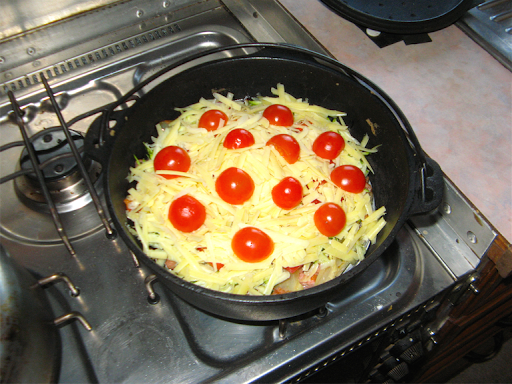 Our exotic dinner tonight is a quiche, but without the pastry, cooked in a camp oven and served with sweet and normal potatoes. 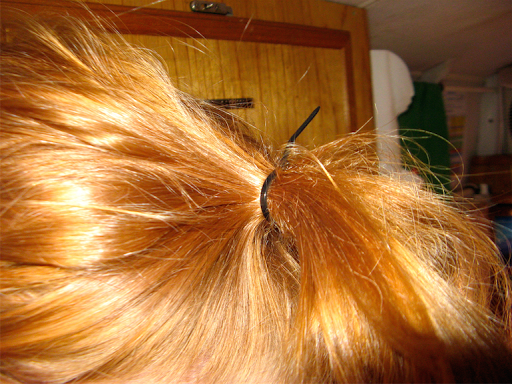 Janet got a bit hot slaving away in the kitchen so I used a tie wrap to tie back her hair. 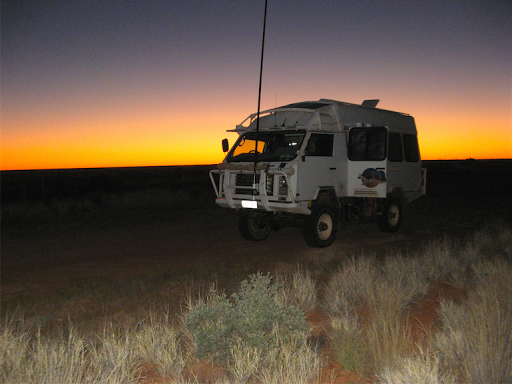 It was exactly a year ago that we got bogged on the Hunt Oil Road in the Gibson Desert and had to dig ourselves out, it was the main reasons we fitted diff lockers this year, so now we can go much further before having to dig ourselves out. 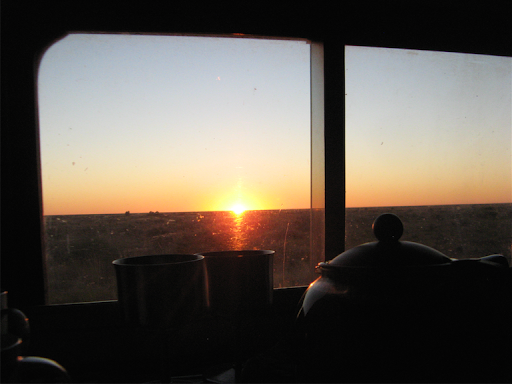 A beautiful flat desert sunrise greeted us this morning right outside the kitchen window. 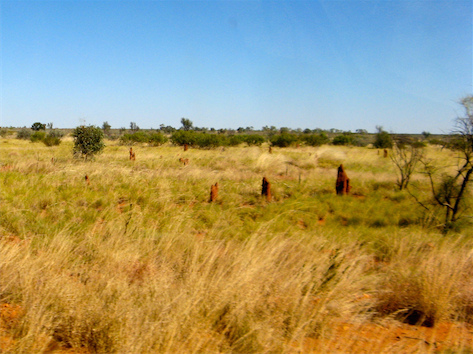 Today we completed the Tanami Track to Wolfe Creek about 120km from the township of Halls Creek, which is close enough for practical purposes. We’ve been driving almost non stop for 6 days and covered 2400km. The exact spot where in 2002 we blew out a tyre on our LandRover. And the top of the Canning Stock Route that we went down in 2007. 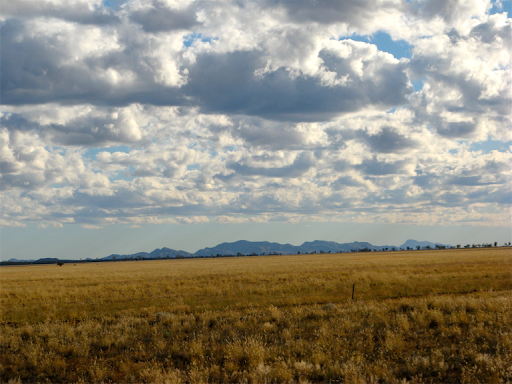 If you go far enough south it comes out in Willuna, 1900km and 1200 sand dunes later, not a track for the feint hearted. 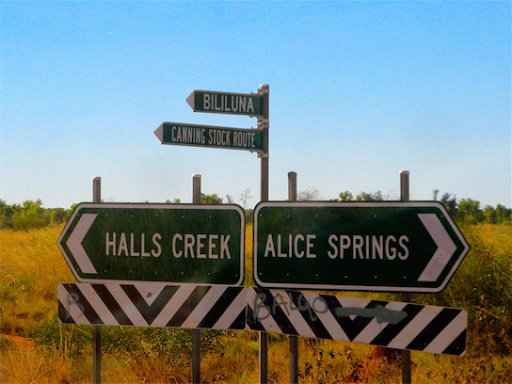 We had lunch at the border between WA and the NT surrounded by “Welcome to WA and NT signs”. The GPS can’t be wrong and if the maps were not properly calibrated all our other positions would be wrong too, which they aren’t, I tried several different maps. So our only explanations are that either the maps are drawn with the border in the wrong place, which is unlikely, or all the signs have been put up in the wrong place. 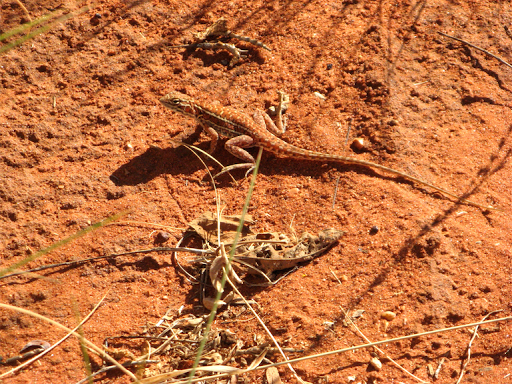 But something is definitely wrong..
We made contact with Dave on the radio who is visiting friends on Jubillee Station near Fitzroy Crossing. 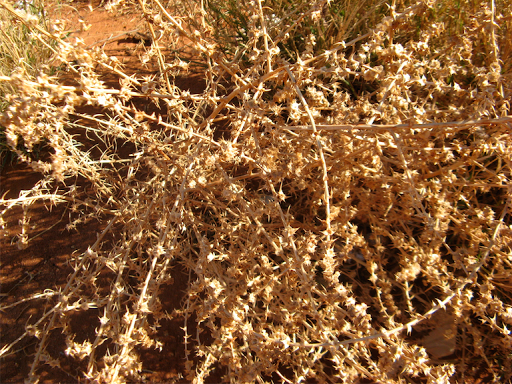 Tomorrow we’ll meet up with Deano and Kaye in Halls Creek and together we’ll meet up with Dave and Pauline on Tuesday for our attempted crossing of the Great Sandy Desert. Some of the tracks do or did exist, some we’ll have to construct but others have done it before and we are collectively sensible, experienced and well equipped travellers so we will know when to backtrack or change our plans as necessary.